Just a girl with a hammer: Habitat! Sweet habitat! I did it! The Audubon Society certified my yard as backyard habitat! Getting this entailed a bunch of stuff (all of it here) including turning 5% of my available yard (and boy do they measure) over to native plants, disconnecting my downspouts, having a birdbath, practicing integrated pest management (no pesticides), and removing aggressive weeds (like all the Himalayan blackberry). I had to bicker a little with the woman at the end over heuchera and whether it's native (turns out it counts as a native plant). There are a lot of benefits to getting certified (like insanely cheap native plants) but I mostly wanted the bragging rights. And I'm still enough of a hippie that I dig being part of a program that is trying to encourage habitat for native species. It also helps that native plants in the northwest are so pretty. I'm really excited for everything to start growing again this spring so I can see who decides to fly in and visit me. This last season was mostly hummingbirds (yay!) and crows (boo). The rep from The Audubon Society said my front yard would a good contender for a rain garden. 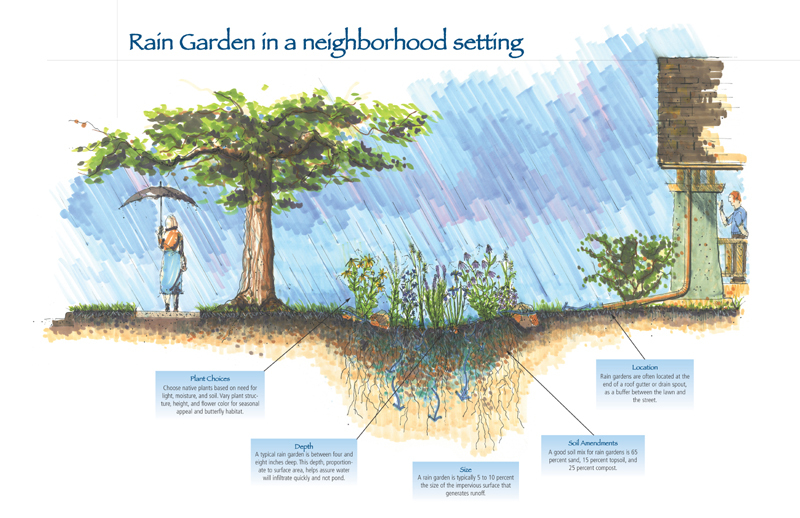 A rain garden harvests the storm water from your property and, instead of dumping it in the sewer, directs it to a densely planted area that allows the water to naturally percolate into the ground, much like it would in a forest. They offer free classes in Portland so I think I'll sign up and look into it. I've been meaning to do a rain garden, too. So awesome! Now I'm all jealous & want to have a certified back-yard as well! Do it! If you wanna take a class together just let me know. :) We can egg each other on!